FAIT ACCOMPLI: Beaumaris Conservation Society Inc. has photographs showing the three small falls of rock from the Beaumaris Cliff that were evident before the above works began on the area leased by the Beaumaris Motor Yacht Squadron Ltd. The deposits of fallen rock were quite weathered, and appear to have been in position for some time. Mesh webbing cordoned off the toe of the cliff, but there were no signs apparent warning the public of the danger of falling rocks. URGENCY IS NOT CREDIBLE: Rock falls are obviously a public safety issue, but the actual falls were not very recent. The falls were reported to authorities in a letter of February 2005, and it is fair to ask whether the unadvertised cliff shaving in August 2005 was truly an emergency response, or was instead a pre-emption of alternative remedies such as a mesh barrier to hold rolling rocks, as it appears to be only deflected rocks that come out onto areas that are usable by members and the public. The Beaumaris Cliff has existed since the Miocene epoch (we are now in the Holocene epoch). The Beaumaris Fossil Site was inscribed on the Register of the National Estate by the Australian Heritage Council in 1999 on the nomination of Bayside City Council, and it is internationally renowned by palaeontologists, including the late Harvard University authority, Professor George Gaylord Simpson, who had written attesting to the significance of the site in world terms. The photograph on the Register can be seen by clicking here. EARTHMOVING MACHINE BELOW CLIFF: On Monday, 29th August 2005, a BCS Inc. member sent PPCC Inc. photographs of a heavy earthmoving machine that was on the open car park area at the BMYS, having been admitted through the pair of locked vehicle gates by which BMYS controls vehicle access to that site. 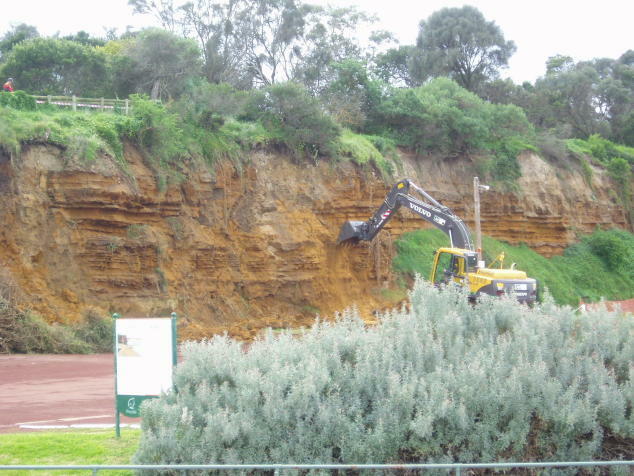 PPCC Inc. therefore contacted the Manager Coasts, Port Phillip Region, of the Department of Sustainability and Environment and left a message for him warning of what has happened, and what we have heard could happen and asking him whether ministerial and planning consent had been given to any works on the cliff, as required by Section 37 of the Coastal Management Act 1995. There does not appear to have been any advertisement on the site, or in local newspapers, referring to an application for a permit for such works, as is required under the Bayside Planning Scheme for the VP01 vegetation removal that has since occurred. BCS Inc. has a photograph of a large pile of the vegetation removed. WORKS BEGAN ON TUESDAY MORNING: PPCC Inc. received a return call on Monday from Mr Michael Behnke, from the Manager Coasts’ office, telling us that the DSE had issued approval, under emergency provisions, to permit works on the cliff in order to prevent future rock falls that could reach the parking area below. He said he had inspected the site that morning, but that there would be no DSE staff available to be on site during the works, which were due to start on Tuesday morning. PPCC Inc. said there should be a representative from a responsible authority on the site during the works that could move to limit damage to the cliff if necessary. He has since said he contacted Bayside City Council, and they would send their Mr Kevin Alexander, who works with their Mr Michael Coleman, whom we know, to be an observer that could get DSE if needed to limit any untoward, unnecessary or excessive alterations to the cliff face. whether the Australian Heritage Council should not have been emailed to officially inform it in writing before a fait accompli occurred, as seems courteous at the very least, of the alterations to a geological feature that it inscribed on the Register of the National Estate at the nomination of Bayside City Council, even though there is no legal or constitutional obligation for the AHC to be informed.